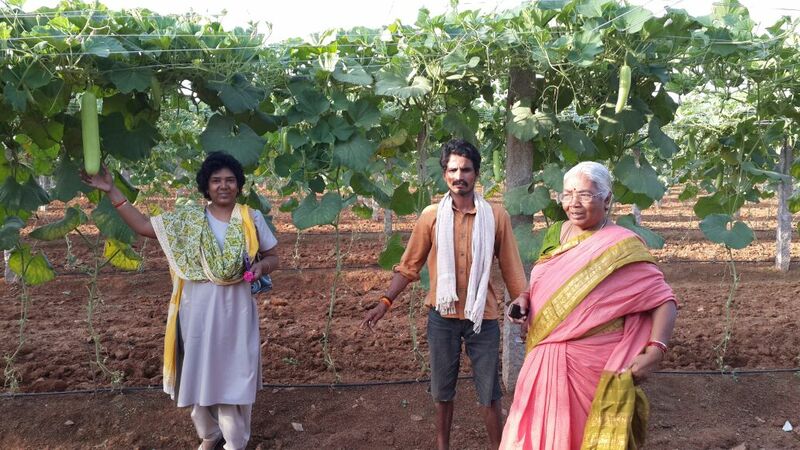 Visit to a farm near Sivanagar in Telangana – Simple pleasures of life. Who wouldn’t love to go on a long drive to a place surrounded by lush greenery , away from the hustle bustle of the city life. This time it was a drive to Peddakanjerla, Amdoor , Sivanagar via Inole along with my sister, mom , a colleague and her hubby. 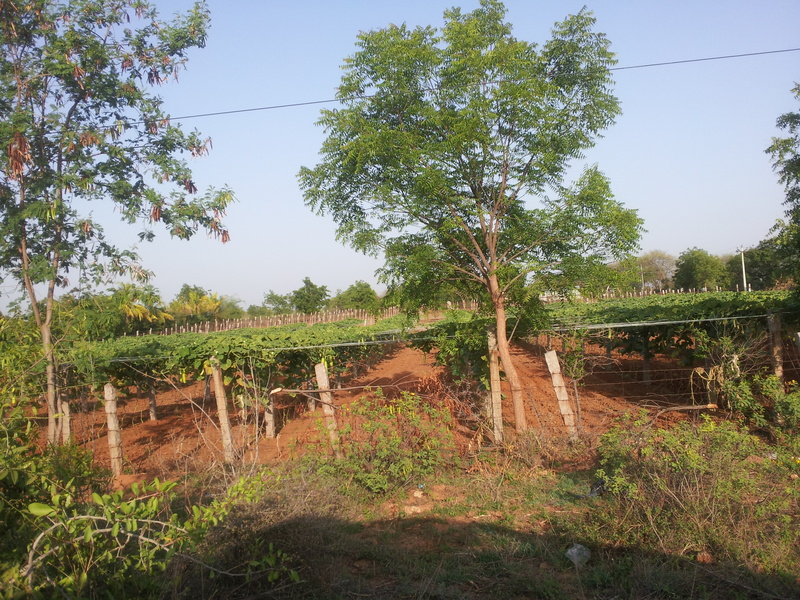 The place is about 10 km from the Outer ring road in Hyderabad to the North of Patancheru . We had unusual rains for a few days last week though it is summer during this part of the year. These rains helped the grass grow and it was like a green carpet all over. We came across golden paddy fields which were ready to be harvested. We stopped outside the gate . We saw a small house behind the gate . We honked , hoping to see someone and a couple came out of the small house and stood behind the gate. We asked , from inside the car, if we can buy a few bottle-gourds. They nodded , went in and brought the key to the gate and let us in. We were thrilled. Why not !!? 🙂 we were lucky that the couple let us in .Who wouldn’t love to stroll around a field. As we stepped in we could smell the sweet flavours of Jackfruit and sapota/Chickoo. There were a few of these trees adjacent to the fence . The woman quickly plucked a few roses from a nearby bush and handed one to each of us. 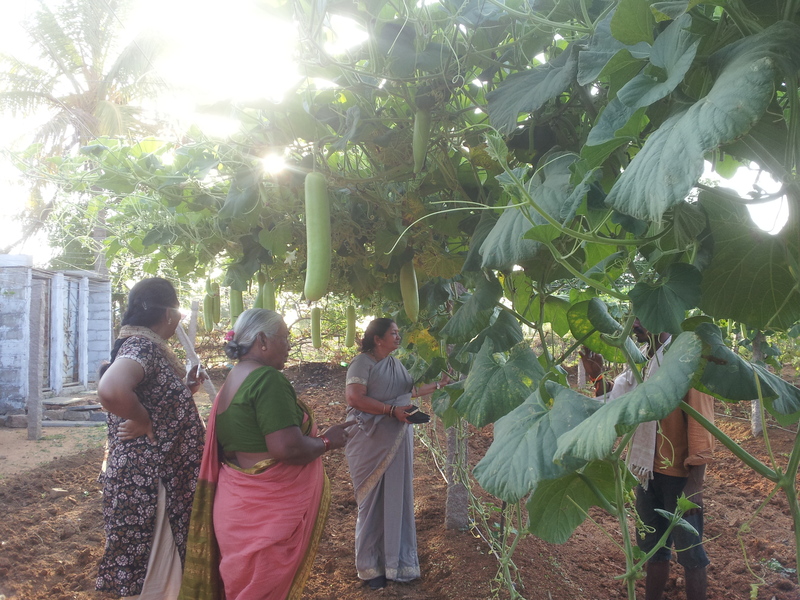 That was a rosey welcome 🙂 We moved closer to the Bottle gourd plants and saw hundreds of them hanging from a trellis built at height of 7 feet from the ground. 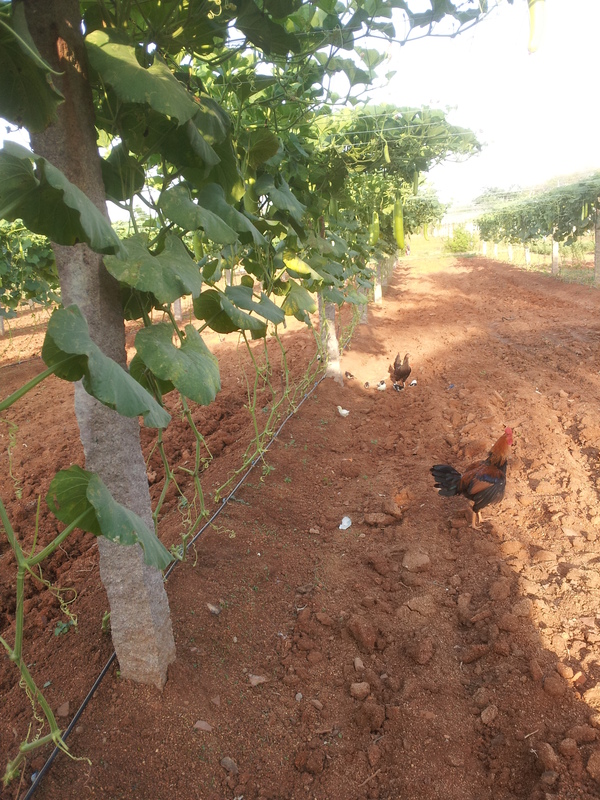 The plants were watered using Drip irrigation. See the black pipes at ground level in the pic below ? Felt good watching little chicken running around their mother in the field . The caretaker was highly enthusiastic and explained how the plants are grown. They wanted us to go around the whole place . There were mango trees too and said we should visit again 🙂 We were a little curious as to how they make their living and they said that the owner gives a fixed amount at the beginning of the year along with some rice. Felt so good to spend some time there and my feet refused to turn back. 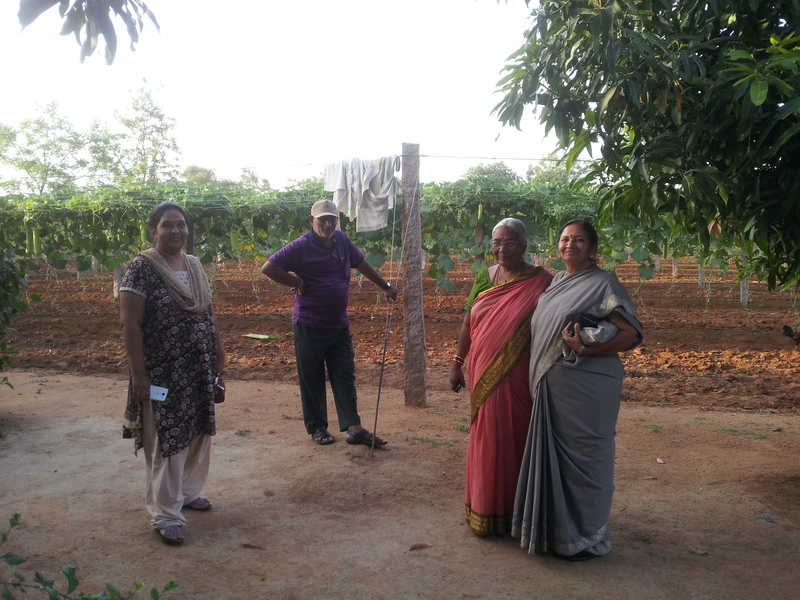 This is the team that visited the farm. The caretakers were too shy to pose for the camera 🙂 but i insisted. That’s Mom, the caretaker and me. The sun was beginning to set , it was time to go back home and bid farewell to the smiling couple . 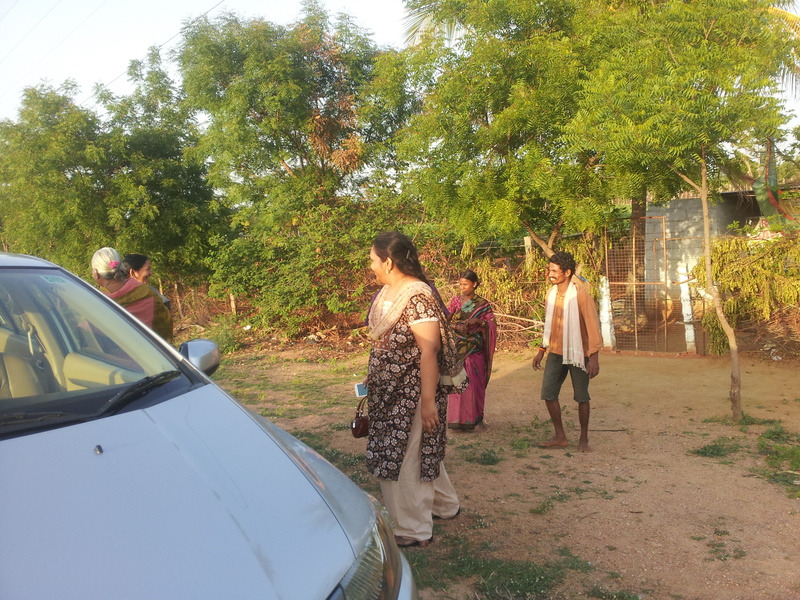 As our vehicle got closer to the city , we got immersed in the noisy world of vehicles , concrete and pollution the greenery and simple people/life were left behind . I feel energized and the memories will continue to energize till we go on another drive. 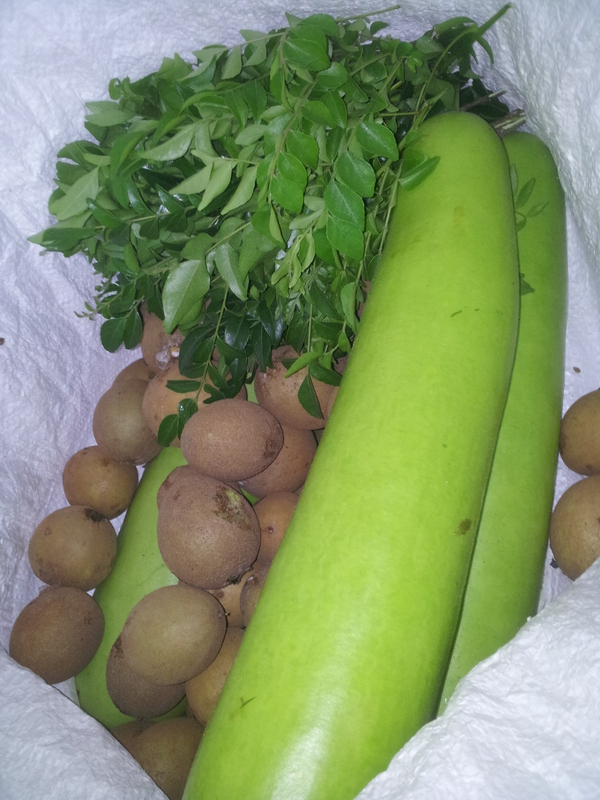 Categories: Uncategorized | Tags: bottle-gourd, bottlegourd, Drive, Farm, Hyderabad | Permalink.